Can computers help us conserve biodiversity? Thankfully, efforts are underway to try and curb some of these negative influences. But without knowing better what exactly their consequences are, it is almost like driving in the dark without the headlights on. Is there a way to estimate more accurately what the biodiversity consequences are of, e.g., a two-degree increase in global temperature? It turns out the answer is yes (at least to some extent), thanks to mathematics and computers. In recent years, ecologists have been using sophisticated mathematical modeling techniques, in combination with large computer systems, to predict changes in species distributions as a consequence of climate change. The main idea behind such models is that of the ecological niche. Humans are considered a "generalist" species. We have adapted to an impressive range of environments, from the hot deserts of Africa to the frozen world of the Arctic. Few other species occupy such a wide range of environmental conditions (although ants and cockroaches seem to be doing a pretty good job as well). Most species are more limited in where they can live, and are often highly adapted to a very specific and narrow range of conditions. The particular combination and range of conditions a given species can live in, is referred to as its niche. Prof. Antoine Guisan, University of Lausanne, Switzerland. 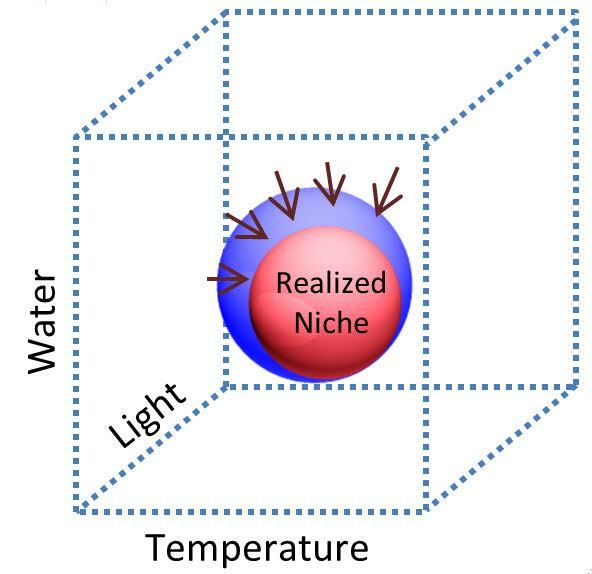 The ecological niche: A species' niche can be visualised as a sub-region in a high-dimensional space, where each dimension represents a specific environmental condition, such as average annual temperature or amount of sunlight. Species distribution models (see below) try to estimate a species' realised niche (red ball): those combinations of environmental conditions in which the species is currently known to be present. This can be smaller than its fundamental niche (purple ball): all combinations of conditions in which a species could live. 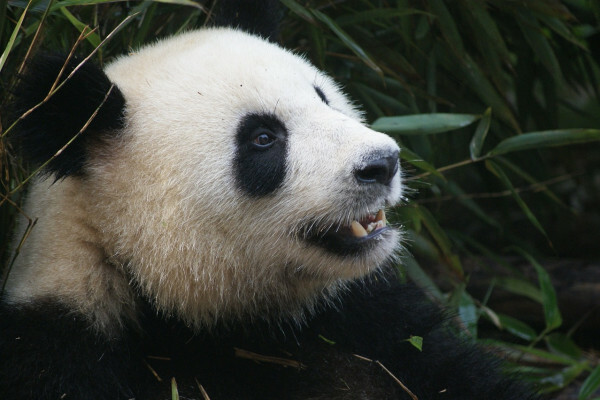 In order to understand how influences like climate change, pollution, and agricultural expansion affect a given species, it is necessary to know what its niche is. For some species, this could be studied experimentally, for example by subjecting specimens of the given species to a variety of conditions in a controlled lab environment. But this is generally costly and time consuming to do. However, it is also possible to use mathematical techniques to estimate a species' (realised) niche. Suppose we have data on where a given species occurs (presences), and where it does not (absences). The main idea is then to correlate this presence/absence data with environmental data for the corresponding locations. This environmental data can include conditions such as elevation, soil type, average annual temperature, average annual rainfall, and so on. Much of this kind of data is available at an increasingly detailed resolution for many areas of our planet. Next, a mathematical relationship between a species' absence/presence data and the corresponding environmental conditions is estimated. This relationship, represented by a mathematical model, provides a formal estimation of a species' realised niche. And this model, in turn, can be used to predict how a species' presences and absences would change when one or more of the environmental conditions change, such as an increase in average temperature or loss of habitat due to agricultural expansion. This provides direct insight into how the (current) distribution and diversity of species will change under the influence of specific changes in environmental conditions, or even which species might go extinct altogether, and due to which causes. Species distribution modeling: Presences (red dots) and absences (black crosses) for a given species (top-left) are correlated with environmental data (bottom-left), resulting in a mathematical model (center) that can be used to predict changes in species distributions (bottom-right) as a consequence of changes in environmental conditions (top-right). What the results of such species distribution models indicate, is that significant extinctions will indeed happen, but probably not for another several decades. However, what they also indicate is that the only way to prevent, or at least reduce, these future extinctions is by acting now. To maintain a sufficient level of biodiversity, we will have to design and implement preservation policies today, such as the creation of more protected wildlife areas and migration corridors, and a change to more sustainable farming and land development practices. We cannot afford to wait a few more decades and then try to deal with the situation. It will simply be too late. Given the large data sets that are involved in these models, and the complicated mathematics behind the estimation and prediction techniques, the use of powerful computers has become a necessity. There are currently several computer programs available for supporting such compute-intensive species distribution analyses. One of these programs is called ecospat. The ecospat software package is produced by the Spatial Ecology Group of the University of Lausanne, Switzerland, and provides various methods and utilities for spatial and temporal predictions of species distributions, species community properties, and related niche analyses. It has already been used successfully to analyse many different species, such as alpine plants, river otters, and arctic fish, and the results are starting to have a real impact on environmental policy design and implementation. One example is the successful revival of the otter in Switzerland, based on the group's modeling work. A recent publication by the group in the high-profile scientific journal Ecography describes and explains their software package in detail, and the program itself has been made available for free. This way, it will become possible for other researchers and policy makers to also start using these modeling and prediction techniques, on an even larger diversity of species and wider range of environmental conditions. Hopefully this will then contribute to an increasingly efficient and successful global biodiversity preservation effort. Shopping Online - Are Reviews Trustworthy?